As smartphone adoption continues to climb in the U.S., mobile applications, or apps, are becoming increasingly important tools that offer access to everything from news and social networking sites to online banking and maps. But even free apps can involve potential tradeoffs when it comes to permitting access to personal devices and information. Additionally, Pew Research surveyed Americans about their privacy concerns relating to apps and found many are cautious when it comes to how apps use their personal data. Our analysis of permissions focused on Android apps, which are not representative of all apps on all platforms. We used Android apps for the study because data for them are more readily available to the public. 1 Among all smartphone app users, six-in-ten downloaders have chosen not to install an app when they discovered how much personal information the app required in order to use it. Separately, 43% have uninstalled an app for the same reason after initially downloading it. 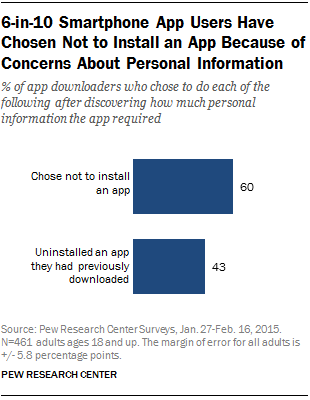 2Among all smartphone owners who have downloaded apps before, a majority cited concerns about how their personal data are used as a reason why they would or would not download an app. Nine-in-ten app downloaders say that having clear information about how their data will be used is “very” or “somewhat” important when choosing whether or not to download an app. 3Most Android app permissions seek access to a device’s hardware, rather than a user’s personal information. Of the 235 distinct types of permissions associated with apps in the Google Play Store, most (165) relate to allowing an app access to the device’s hardware, such as allowing the app to control the camera flash or prevent the device from going to sleep, while 70 app permissions could allow access to personal information. Personal information in this context relates to getting a user’s precise location using GPS or reading data about your contacts stored on your device. 4 The most common Android app permissions allow access to a smartphone’s internet connectivity. The average app requested five permissions before installation, and the two most common permissions sought by Android apps help those apps access the internet. These include the “Full network access” permission (used by 83% of apps), which allows an app to access whatever network the device is connected to at the time, as well as the “View network connections” permission (used by 69% of apps). The latter type of permission enables an app to see what networks the device is able to access. The third- and fourth-most-common permissions allow apps to access memory or available storage on the phone, a feature apps would need in order to save content to the device. 5 A majority of Android apps we analyzed were free. Some 82% of apps in the Google Play Store from June through September 2014 were free to download, while 18% required purchasing before being able to download. On average, free apps ask for two more permissions than paid apps (six permissions vs. four). Note: Details on the full methodology of the report are available here.